Click here to view the Code Related FAQs as a pdf. What are the code requirements in a 1-hour exit corridor? The codes allow 20-minute fire doors with 20-minute vision panels without hose stream in 1-hour exit corridors. Sidelites and transoms around the door in a 1-hour exit corridor require a 45-minute fire rating with hose stream. Fire windows are required to be rated 45-minutes, and are limited to under 25% of the total wall area. If more window glazing is desired, fire-resistive glazing assemblies rated equal to the wall must be used. READ MORE…. What are the code requirements for 1- and 2-hour exit/stairwell enclosures? In a sprinklered building, can you increase the size of the door vision panel in an exit/stairwell enclosure? No. 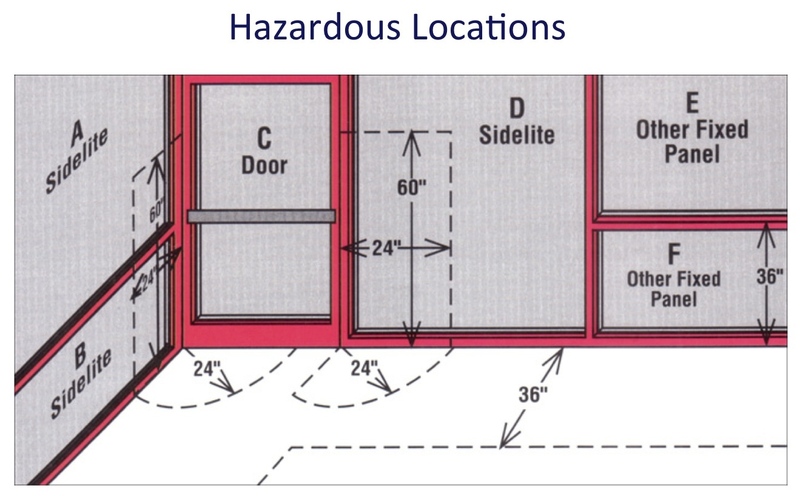 In the 2000 IBC, an exception was provided that allowed the use of non-temperature rise doors if a building was fully sprinklered in accordance with Chapter 9. 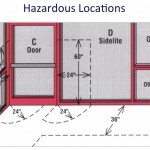 The 2012 IBC was amended to clarify that the maximum allowable vision panel in a 60- or 90-minute, temperature-rise door in an exit enclosure or passageway is 100 sq inches, regardless of whether the building is fully sprinklered or not. The only way to increase the size of a vision panel in a 60- or 90-minute door in an exit/stairwell enclosure is to use fire resistive glazing. Why do codes sometimes require sidelites and transoms to have higher ratings than door openings? What are the code requirements for fire rated framing? an “area subject to human impact load”? 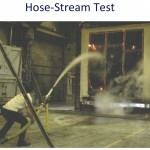 What is the hose stream test? Why is it required? Can I use one type of fire rated glass for all my applications? Architects and designers should be wary about products that are marketed using the fire endurance rating (20 minutes to 3 hours) without any reference to its overall performance or limitations. Why? Because having a one-size-fits-all approach to fire rated glass not only leads to faulty specifications, but also significant expense when fire marshals and building officials order the glass to be changed because the wrong product is installed. The current IBC recognizes 2 categories of fire rated glass fire protective and fire resistive. These two types of fire rated glass are based on the testing criteria that the product has met, not just the duration rating. Fire protective glass products are tested to NFPA 252/257 and blocks smoke and flames. They are typically used in 20-45 minute applications and subject to size limitations dictated by code. Fire resistive glass products are tested to ASTM E-119/NFPA 251/UL263 and blocks smoke, flames and radiant heat. They are typically used in 60-120 minute applications and are only subject to tested size limitations. What are my product options for 1 hour exit corridors? 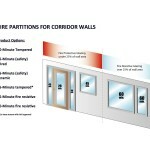 Generally speaking, exit corridors have a fire resistance rating of 1 hour. Table 716.5 in the 2012 IBC outlines the requirements for door, sidelite and transom assemblies. Doors: 20 minute fire protective glass tested without hose stream. Products include specialty tempered, safety wired glass, filmed ceramics and laminated ceramics. All these options meet CPSC Cat. I and II impact safety. Sidelites: 45 minute fire protective glass tested with hose stream*. Products include 45-minute fire resistive intumescent tempered units, specialty tempered, safety wired glass, filmed ceramics and laminated ceramics. All these options meet CPSC Cat. I and II impact safety. Transoms: 45 minute fire protective glass tested with hose stream*. Products include 45-minute fire resistive intumescent tempered units, safety wired glass, traditional wired glass, plain ceramics, filmed ceramics and laminated ceramics. This application does not require meeting CPSC impact safety requirements. Openings not exceeding 25% of the wall area: 45 minute fire protective glass tested with hose stream*. Products include 45-minute fire resistive intumescent tempered units, specialty tempered, safety wired glass, filmed ceramics and laminated ceramics. All these options meet CPSC Cat. I and II impact safety. Openings exceeding 25% of the wall area: 60 minute fire resistive glass tested with hose stream. Products include 60 minute fire resistive intumescent tempered units. This product also meets CPSC Cat. I and II impact safety. The GSA and AHJs have allowed the use of a fire protective heat-reflective specialty tempered product tested without hose stream in 45 minute sidelites, transoms and openings for the cost benefits and added safety that it provides. What are my product options for 1 and 2 hour exit enclosures/stairwells? 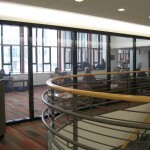 Fire resistive glass and frames meet ASTM E119 wall standards. The IBC requires interior exit stairways be enclosed to protect building occupants from smoke, flames and radiant heat as they are exiting the building.Â Exit enclosures/stairwells four stories or more must be 2 hour fire resistance rated; exit enclosures/stairwells less than four stories must be 1 hour fire resistance rated.Â Table 716.5 in the 2012 IBC spells out the door assembly requirements for 1 and 2 hour exit enclosure/stairwells. 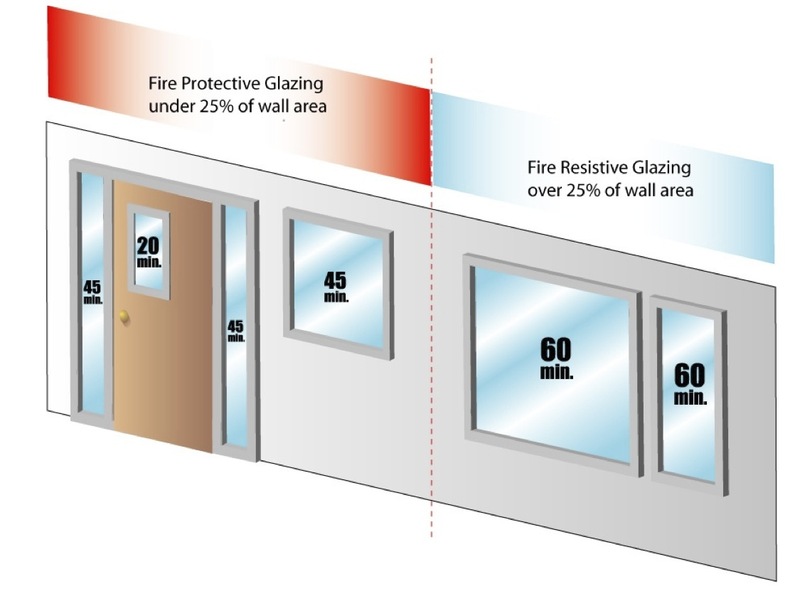 Doors: 60 or 90 minute fire protective glass limited to 100 square inches. Products include specialty fire protective, safety wired glass, filmed ceramics and laminated ceramics. To exceed 100 square inches in the door vision panel, either 60 minute fire resistive intumescent tempered units must be used in 1 hour stairwells, and 90 minute fire resistive intumescent tempered units must be used in 2 hour stairwells. Sidelites and Transoms: 60 or 120 min. fire resistive glass rated equal to the wall. Products include 60 minute fire resistive intumescent tempered units for 1 hour stairwells, and 120 minute fire resistive intumescent tempered units for 2 hour stairwells. Note that fire protective glazing like wired glass or ceramics are not allowed in this application. If the building is fully sprinklered, can I use large panels of fire protective glass? Under the 2012 IBC, door vision panels glazed with fire protective glazing, such as ceramics and wired glass, are limited to 100 sq. inches, whether the building is fully sprinklered or not. To exceed 100 sq. inches in the door vision panel, fire resistive glazing must be used. Under the 2009 and 2006 IBC, larger fire protective glazing in door vision panels may be used in 1-hour exit enclosure and exit passageway doors only where the building – not just the door assembly – is fully sprinklered. Under the 2012, 2009 and 2006 IBC, fire protective glazing is not allowed in the sidelites, transoms and openings surrounding the 60 minute door, whether the building is fully sprinklered or not. The glazing must be fire resistive and rated equal to the wall. Can I use hollow metal framing with fire-resistive glazing? Are there glass products that protect against ballistic attack or forced entry? After tragic events at Sandy Hook, there has been more emphasis on keeping students and staff safe in case of an attack. School districts nationwide have considered upgrading windows and doors to meet ballistic or forced entry. In areas where fire rating requirements exist, there are products available today that can meet these additional security requirements. SAFTIFIRST has fire and ballistic rated systems that can meet up to level 8 ballistic and level 1 attack resistance, while also meeting ASTM E-119 up to 2 hours. SAFTIFIRST also offers fire resistive glass products that provide the highest level of protection required by the rigorous standards established by the California Department of Corrections. Have more questions on fire rated glass and framing? Send them to codesupport@safti.com and our technical representative will be happy to assist you.